Jericho Sands has spent the past nine months in Mexico getting in bar fights with shark poachers, drinking tequila and listening to wolves howl outside the walls of the beachfront shack he's been calling home. He's living completely 'off the grid'; no power, no phone, nothing but nagging questions about who he is and how far he allowed himself to fall for a woman who proved to be a serial killer hell-bent on revenge. He's struggled with his decision to let Alyssa Jagger live. Was it because he realized that revenge does not equal justice? Or did he spare her life because deep down, in a dark place he doesn't want to explore, he allowed himself to fall for her and could not bring himself to be her executioner. Jericho's self-imposed exile is ended when he learns about the murder of his best friend and father figure, Gus Tanner. Gunshots fired in a dark alley force Jericho back to the city he left behind and he soon discovers that a new killer is making himself known, a daring young painter who uses the blood of his victims as the medium for his works of art. The butcher who the media dubs 'The DaVinci of Death', leaves his handiwork on the front door of a new art gallery and demands that it be displayed, or else more macabre works will follow. Katrina Masters, the owner of the gallery and Jericho's old flame, refuses to be blackmailed, enraging the killer who is determined to make the town appreciate his talents. Even if it kills them all. While facing the fallout from everything he left behind, Jericho must also deal with a new police chief with a personal vendetta, detectives who prove incapable of stopping the killer, his resurrected feelings for Katrina Masters and his conflicted feelings for Alyssa Jagger. To find the killer, Jericho must continue going down roads he does not want travel. He must commit to choices that will forever determine who he truly is. And this time, there will be going back. 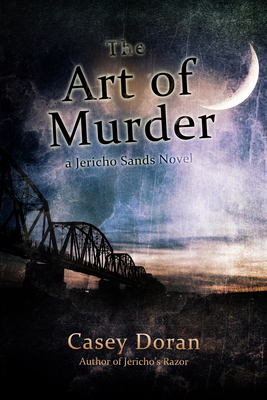 Casey Doran is the author of two Jericho Sands novels: Jericho's Razor and The Art of Murder. A native of Southern California, Casey Doran learned to walk on the sands of Redondo Beach and spent his teenage years chasing the perfect wave everywhere from Baja Mexico to Washington State. He's spent time in five star resorts, biker bars run by the Hells Angels and the occasional jail cell, and he's left with stories from all of them. He now lives in central Illinois were he studies philosophy, psychology, and criminology, as well as spending way more time thinking of ways to kill people in gruesome ways than is probably healthy. Casey is currently pursuing a Bachelor's Degree in English Education while working as a deckhand on a riverboat casino and raising a teenage daughter. When he's not writing papers on educational pedagogy, chasing away teenage boys and annoying his neighbors by wailing his Fender Stratocaster to Woodstock levels, he spends the rest of his time finding ways to get Jericho Sands into trouble. Follow Casey on Twitter at @cpdoran.